Published: Oct. 20, 2015 at 07:03 p.m. Updated: Oct. 21, 2015 at 11:44 a.m.
Mario Williams isn't the only prominent Bills defender who believes Rex Ryan needs to make some scheme changes. Defensive tackle Marcell Dareus said Tuesday that Buffalo's game plan is playing against the team's strengths, echoing a sentiment expressed by Williams earlier in the week. "Hey, like (Williams) said, they pay us a lot of money. And we want to use our talents the best way we know how," Dareus said, according to Yahoo! Sports. "If we're going to be dropping we don't want to get questions about not getting sacks. That's just how it is." The Bills have the most expensive defensive line in football, a group that includes Dareus, Williams, Kyle Williams and Jerry Hughes. Buffalo finished first in sacks in 2014 under former defensive coordinator Jim Schwartz. Under Ryan in 2015, Buffalo ranked 27th in sacks per pass attempt. In the offseason, Dareus signed a six-year, $96.5 million deal to remain in Western New York. He has one sack through five games after setting a career high with 10 last season. "We want to make some plays. 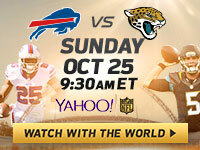 We don't want fans looking at us crazy," Dareus said. "We like making plays. We like getting sacks, just being out there exerting a lot of energy and having fun. "But when we're dropping, when I'm not out there on third down or just I'm dropping or Kyle is dropping or Mario is dropping or Jerry is dropping ... . It's not been a lot of times where there have been all four of us, full tilt, ears pinned back and we're going after it. We haven't had a lot of that this year. "Hopefully Rex is going to implement it. There's nothing we can do." We can't remember an instance during Rex Ryan's six-year tenure in New York when a Jets player publicly called out Ryan's defensive acumen. And with good reason: Ryan has earned a reputation as one of the most gifted defensive minds in the game. But this is also a new situation for Ryan, who never had the benefit of stud pass rushers during his time in Gotham. Perhaps the adjustment period is taking some time.